"The term "Cholestasis" refers to a condition in which the flow of bile, a digestive fluid from the liver, slows or stops." This occurs in late pregnancy and starts with intense itching usually on the hands and feet and sometimes other parts of the body. Cholestasis of pregnancy can be quite harmful for a developing baby. 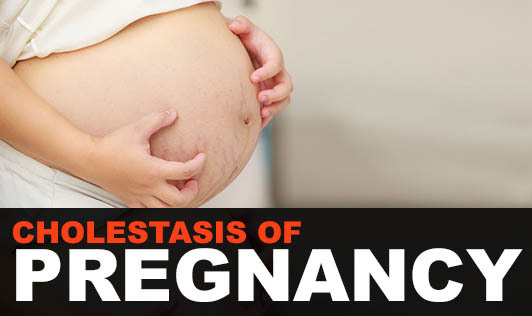 It is also known as Obstetric Cholestasis and Intrahepatic Cholestasis of pregnancy. The cause of Cholestasis of pregnancy is unidentified. However, this condition may be related to pregnancy hormones. Bile is a digestive juice that helps in breaking down fats that is produced in the liver and stored in the gallbladder. The pregnancy hormones tend to affect the function of the gallbladder; sometimes the hormones may slow or even stop the flow of bile. Ultimately, the excessive bile may enter the bloodstream; this is known as Cholestasis of pregnancy. If a woman has had the condition once, the risk of developing it during a later pregnancy may be as high as 70%. Cholestasis may increase the risks for preterm birth, fetal distress or stillbirth. Usually, the developing baby depends on the mother's liver to remove bile acids from the blood, hence the high levels of maternal bile cause pressure on the baby's liver. Please contact your doctor if you develop any signs or symptoms of Cholestasis of pregnancy.